You can make a strong argument Tigers' closer Joe Nathan's most recent outings would have gone more smoothly with better fielding support behind him. But in reality, he's the one who walked the leadoff hitter to start the fireworks for the Toronto Blue Jays in the ninth inning of a scoreless tie Tuesday at Comerica Park. He is the one who allowed the long home run to Oakland's Josh Donaldson last week. Nathan's ERA is 6.86. His WHIP 1.418. It's unacceptable. ﻿Did the Tigers make a mistake with Nathan. In hindsight, they would be better off with Francisco Rodriguez, a younger, less expensive, but with an equally impressive resume. K-Rod has a WHIP of 0.89 and is tied for the MLB lead in saves for the Milwaukee Brewers, who signed him to a one-year contract worth less than a fifth of what the Tigers have guaranteed to Nathan for two years. What do the Tigers do if this continues? They have two choices on the roster now. Neither is ideal. Joba Chamberlan has limited closing experience, is a rehabilitation project the Tigers have success with so far as a setup man and it would be less than ideal than pulling him out of his role just as he gets comfortable with it. Corey Knebel is a promising rookie. His so-called stuff is as good as anybody on the Tigers' staff, but the process of merely breaking him into the major leagues has just begun. But don't count him out long term for this season. Don't forget, last season the St. Cardinals used Edward Mujica as their closer before turning to youngster Trevor Rosenthal for the postseason. In 2006, when they won the World Series, Adam Wainwright closed for the Cardinals after Jason Isringhausen was injured. Joel Hanrahan is an "X" fsctor. Health is an issue after Tommy John surgery. As big an issue is consistency. Hanrahan has had some success as a closer, but hasn't necessarily been the model of consistency. 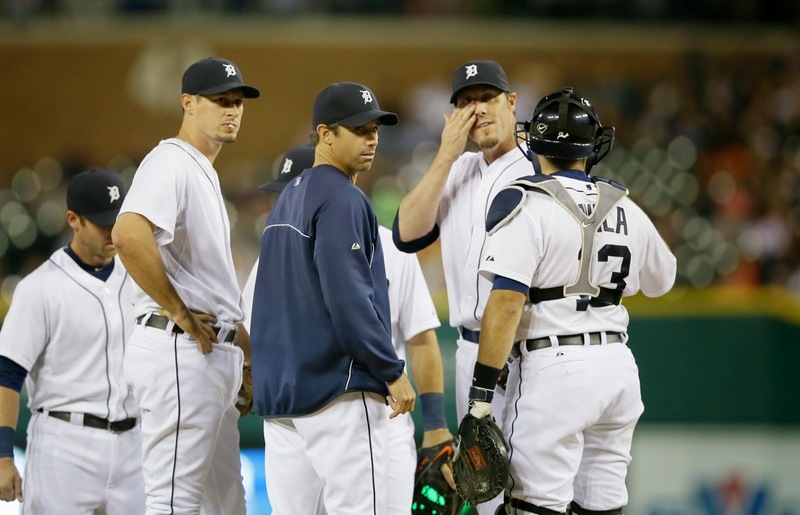 There is also the message manager Brad Ausmus would set by relieving Nathan as closer. What he become, a mopup man? Setting up is nearly as pressure-packed as closing. How do you go back to Nathan after demoting with the season barely turned to May? The left side of the infield is also major problem. Shortstop Andrew Romine (-0.4) and third baseman Nick Castellanos (-0.7) have been among the worst players in MLB this season according to the Sabermetics statistic WAR. The idea Eugenio Suarez is ready to arrive from Triple-A Toledo to save the day at SS is a false one. He has been a brilliant hitter against left-handed pitching, but struggled against right-handers. He's also made nine errors in 54 games, which hardly represents steady fielding. Pat, what do you do? I hope Suarez don't chase too many sliders and make too many errors. I hope Worth gets a chance to play everyday at AAA for his career because he finally catching up to a 95 m.p.h fastball. That is a big step for him and if can recognize the slider from a outside fastball he will be a MLB player. He miss a couple of pop-ups but, Kinsler is a great player, but it look like he is hard to play with. Nathan is not the same as he was a few years ago but still a MLB pitcher. I hate to see the Tigers trade their prospects as the farm system is finally starting be one. The Tigers do have few players available such Perez, Holaday, Melvin M and an OF when Dirks come back. Lots of pitchers at A levels.